Pick up a Penguin! This fine black and gold ceramic ornament is unusual, eye-catching and available now at Fabulous Furniture, your one-stop-shop for all your modern furniture and accessories. The smooth edges and beautiful design of this black and gold penguin ornament is one of those pieces which will get your guests asking questions about how beautiful it is. Standing at a fairly modest 35 cm’s, the intricate colour work on this lovely ornament will add a sense of clas and intrigue to your home. 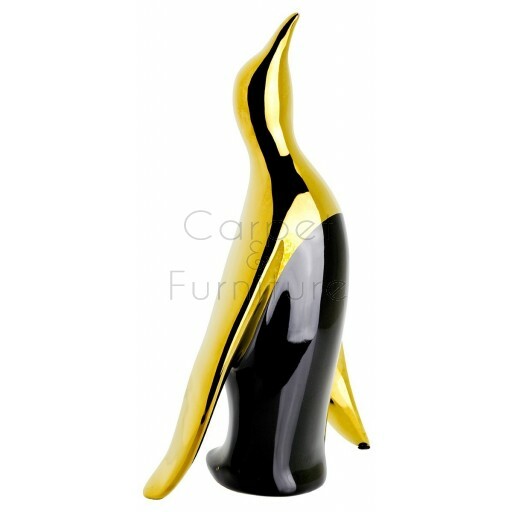 Made in ceramic complete with a black and gold glaze, this penguin looks incredibly expensive and will continue to look like a shining trophy, weeks, months and years into the future. Whether he sits atop your dining table, kitchen table, in your lounge or in your bathroom, this proud trophy with elegant curves and stunning colour is the ideal addition to modern contemporary home.